To kick things off, I'm starting with Zoya Jasmine. I chose this particular color mainly for the name. Jasmine happens to be my mother's name, so it's only fitting that I start off with her. A color from their Classics Collection, Zoya Jasmine is describe as a medium wine red with subtle pink and brown undertones and soft, frosty silver shimmer. The brown undertones were more detectable under shade and indoors. When seen outdoors, the silver shimmer really stands out, making Jasmine appear more pink than red. In the next picture, the silver shimmer is really noticeable. You can see how the silver shimmer runs through the bottle. I think I also detect touch of gold shimmer in there. My camera gravitated heavily towards the silver shimmer in Jasmine. It took me many attempts before I could even come close to getting a good shot at the brown base in the color. Try to ignore the pink. The color of the bottle, and the sides of my nails are a much truer color representation of Jasmine. I find the base to be a very pretty color. For me, the shimmer was a distraction for me. I'm not a fan of the pink shimmer, so I wasn't thrilled with how the silver shimmer came out looking pink. That's just a personal preference. It doesn't take away the fact that this is a beautiful color in which many people will love. 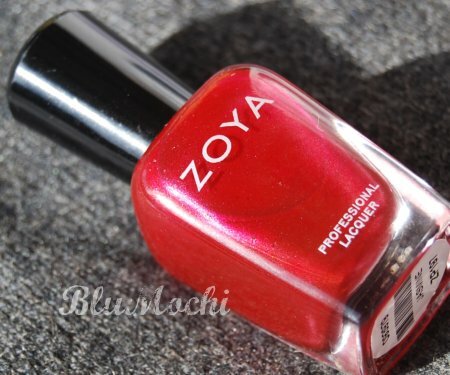 I've always loved Zoya's formula, and the same applies here. The application of Jasmine was so smooth and easy. I love this red on you! I really like the shimmer and I'm looking forward to your month of reds! Ooo! A month of reds. I cannot wait to see them all. great idea... can't wait to see the rest!